If you're a golfer, you should make Pilates your new BFF. We know it's only January, but at STC we are already counting down the days until spring golf season. In the months leading up to the day we can play our first round, we're going to be in the studio conditioning our bodies to make sure it's our best season yet - and if you love golf you should too. You'll quickly realize, like we did, that Pilates is your game's new best friend. Pilates targets the deepest, hardest to reach abdominal muscles through targeted exercises and breathing. With increased core strengths comes power, flexibility and stability. Working on your shoulders in the studio will result in an optimized backswing and follow-through because of your increased range of motion. When you stabilize your core through Pilates, you work on building up those smaller muscles that help find balance and connection through your body. You'll stay smooth and sturdy throughout your rotation. Lack of hip and torso flexibility will prevent your drives from reaching their maximum potential. As you open up your hips and learn how to properly articulate your spine, you'll be able to truly put power and distance behind your swing. Emphasis on evenly. With repetition of the same movements (on the course and off) it's easy for us to build up certain muscles while neglecting others, throwing off your spinal alignment. Pilates concentrates on evenly developing all back muscles so that they connect and protect. This prevents spinal injury while resulting in a smoother, more powerful swing. We know that you can't underestimate the mental game of golf and Pilates can help with that too. One of the most important aspects of the Pilates method is learning how to breath correctly, in a way that is focused and paired with strong movement. Play your best game through all 18 holes. In class, we strive to move through a variety of exercises with seamless transitions. Pilates was designed to create stamina - a benefit you'll notice as you move through class and the course. Nothing ruins a golf season like an injury. Pilates is safe and low impact on your joints. It tones, strengthens and conditions in a way that protects your body from injury while doing so. Want more on Pilates and Golf? 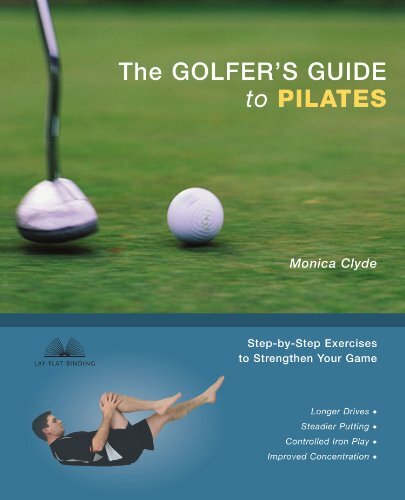 We love the book "A Golfer's Guide to Pilates"